These words seem to be found at the end of the long road that winds through the suffering which forms part of the history of man and which is illuminated by the Word of God. These words have as it were the value of a final discovery, which is accompanied by joy. For this reason Saint Paul writes: "Now I rejoice in my sufferings for your sake"(2). The joy comes from the discovery of the meaning of suffering, and this discovery, even if it is most personally shared in by Paul of Tarsus who wrote these words, is at the same time valid for others. The Apostle shares his own discovery and rejoices in it because of all those whom it can help—just as it helped him—to understand the salvific meaning of suffering. 2. The theme of suffering - precisely under the aspect of this salvific meaning - seems to fit profoundly into the context of the Holy Year of the Redemption as an extraordinary Jubilee of the Church. And this circumstance too clearly favours the attention it deserves during this period. Independently of this fact, it is a universal theme that accompanies man at every point on earth: in a certain sense it co-exists with him in the world, and thus demands to be constantly reconsidered. Even though Paul, in the Letter to the Romans, wrote that "the whole creation has been groaning in travail together until now"(3), even though man knows and is close to the sufferings of the animal world, nevertheless what we express by the word "suffering" seems to be particularly essential to the nature of man. It is as deep as man himself, precisely because it manifests in its own way that depth which is proper to man, and in its own way surpasses it. Suffering seems to belong to man's transcendence: it is one of those points in which man is in a certain sense "destined" to go beyond himself, and he is called to this in a mysterious way. Assuming then that throughout his earthly life man walks in one manner or another on the long path of suffering, it is precisely on this path that the Church at all times - and perhaps especially during the Holy Year of the Redemption - should meet man. Born of the mystery of Redemption in the Cross of Christ, the Church has to try to meet man in a special way on the path of his suffering. In this meeting man "becomes the way for the Church", and this way is one of the most important ones. 5. Even though in its subjective dimension, as a personal fact contained within man's concrete and unrepeatable interior, suffering seems almost inexpressible and not transferable, perhaps at the same time nothing else requires as much as does suffering, in its "objective reality", to be dealt with, meditated upon, and conceived as an explicit problem; and that therefore basic questions be asked about it and the answers sought. It is evident that it is not a question here merely of giving a description of suffering. There are other criteria which go beyond the sphere of description, and which we must introduce when we wish to penetrate the world of human suffering. This questions seems, in a certain sense, inseparable from the theme of suffering. The Christian response to it is different, for example, from the one given by certain cultural and religious traditions which hold that existence is an evil from which one needs to be liberated. Christianity proclaims the essential good of existence and the good of that which exists, acknowledges the goodness of the Creator and proclaims the good of creatures. Man suffers on account of evil, which is a certain lack, limitation or distortion of good. We could say that man suffers because of a good in which he does not share, from which in a certain sense he is cut off, or of which he has deprived himself. He particularly suffers when he a ought"—in the normal order of things—to have a share in this good and does not have it. Considering the world of suffering in its personal and at the same time collective meaning, one cannot fail to notice the fact that this world, at some periods of time and in some eras of human existence, as it were becomes particularly concentrated. This happens, for example, in cases of natural disasters, epidemica, catastrophes, upheavals and various social scourges: one thinks, for example, of a bad harvest and connected with it - or with various other causes - the scourge of famine. One thinks, finally, of war. I speak of this in a particular way. I speak of the last two World Wars, the second of which brought with it a much greater harvest of death and a much heavier burden of human sufferings. The second half of our century, in its turn, brings with it—as though in proportion to the mistakes and transgressions of our contemporary civilization—such a horrible threat of nuclear war that we cannot think of this period except in terms of an incomparable accumulation of sufferings, even to the possible self-destruction of humanity. In this way, that world of suffering which in brief has its subject in each human being, seems in our age to be transformed—perhaps more than at any other moment—into a special "world": the world which as never before has been transformed by progress through man's work and, at the same time, is as never before in danger because of man's mistakes and offences. The story of this just man, who without any fault of his own is tried by innumerable sufferings, is well known. He loses his possessions, his sons and daughters, and finally he himself is afflicted by a grave sickness. In this horrible situation three old acquaintances come to his house, and each one in his own way tries to convince him that since he has been struck down by such varied and terrible sufferings, he must have done something seriously wrong. For suffering—they say—always strikes a man as punishment for a crime; it is sent by the absolutely just God and finds its reason in the order of justice. It can be said that Job's old friends wish not only to convince him of the moral justice of the evil, but in a certain sense they attempt to justify to themselves the moral meaning of suffering. In their eyes suffering can have a meaning only as a punishment for sin, therefore only on the level of God's justice, who repays good with good and evil with evil. The point of reference in this case is the doctrine expressed in other Old Testament writings which show us suffering as punishment inflicted by God for human sins. The God of Revelation is the Lawgiver and Judge to a degree that no temporal authority can see. For the God of Revelation is first of all the Creator, from whom comes, together with existence, the essential good of creation. Therefore, the conscious and free violation of this good by man is not only a transgression of the law but at the same time an offence against the Creator, who is the first Lawgiver. Such a transgression has the character of sin, according to the exact meaning of this word, namely the biblical and theological one. Corresponding to the moral evil of sin is punishment, which guarantees the moral order in the same transcendent sense in which this order is laid down by the will of the Creator and Supreme Lawgiver. From this there also derives one of the fundamental truths of religious faith, equally based upon Revelation, namely that God is a just judge, who rewards good and punishes evil: "For thou art just in all that thou hast done to us, and all thy works are true and thy ways right, and all thy judgments are truth. Thou hast executed true judgments in all that thou hast brought upon us... for in truth and justice thou hast brought all this upon us because of our sins"(23). 12. The Book of Job poses in an extremely acute way the question of the "why" of suffering; it also shows that suffering strikes the innocent, but it does not yet give the solution to the problem. We here find ourselves—and we must clearly realize this in our shared reflection on this problem—faced with a completely new dimension of our theme. It is a different dimension from the one which was determined and, in a certain sense, concluded the search for the meaning of suffering within the limit of justice. This is the dimension of Redemption, to which in the Old Testament, at least in the Vulgate text, the words of the just man Job already seem to refer: "For I know that my Redeemer lives, and at last... I shall see God..."(28). Whereas our consideration has so far concentrated primarily and in a certain sense exclusively on suffering in its multiple temporal dimension (as also the sufferings of the just man Job), the words quoted above from Jesus' conversation with Nicodemus refer to suffering in its fundamental and definitive meaning. God gives his only-begotten Son so that man "should not perish" and the meaning of these words " should not perish" is precisely specified by the words that follow: "but have eternal life". Man " perishes" when he loses "eternal life". The opposite of salvation is not, therefore, only temporal suffering, any kind of suffering, but the definitive suffering: the loss of eternal life, being rejected by God, damnation. The only-begotten Son was given to humanity primarily to protect man against this definitive evil and against definitive suffering. In his salvific mission, the Son must therefore strike evil right at its transcendental roots from which it develops in human history. These transcendental roots of evil are grounded in sin and death: for they are at the basis of the loss of eternal life. The mission of the only-begotten Son consists in conquering sin and death. He conquers sin by his obedience unto death, and he overcomes death by his Resurrection. 15. When one says that Christ by his mission strikes at evil at its very roots, we have in mind not only evil and definitive, eschatological suffering (so that man "should not perish, but have eternal life"), but also—at least indirectly toil and suffering in their temporal and historical dimension. For evil remains bound to sin and death. And even if we must use great caution in judging man's suffering as a consequence of concrete sins (this is shown precisely by the example of the just man Job), nevertheless suffering cannot be divorced from the sin of the beginnings, from what Saint John calls "the sin of the world"(29), from the sinful background of the personal actions and social processes in human history. Though it is not licit to apply here the narrow criterion of direct dependance (as Job's three friends did), it is equally true that one cannot reject the criterion that, at the basis of human suffering, there is a complex involvement with sin. It is the same when we deal with death. It is often awaited even as a liberation from the suffering of this life. At the same time, it is not possible to ignore the fact that it constitutes as it were a definitive summing-up of the destructive work both in the bodily organism and in the psyche. But death primarily involves the dissolution of the entire psychophysical personality of man. The soul survives and subsists separated from the body, while the body is subjected to gradual decomposition according to the words of the Lord God, pronounced after the sin committed by man at the beginning of his earthly history: "You are dust and to dust you shall return"(30). Therefore, even if death is not a form of suffering in the temporal sense of the word, even if in a certain way it is beyond all forms of suffering, at the same time the evil which the human being experiences in death has a definitive and total character. By his salvific work, the only-begotten Son liberates man from sin and death. First of all he blots out from human history the dominion of sin, which took root under the influence of the evil Spirit, beginning with Original Sin, and then he gives man the possibility of living in Sanctifying Grace. In the wake of his victory over sin, he also takes away the dominion of death, by his Resurrection beginning the process of the future resurrection of the body. Both are essential conditions of "eternal life", that is of man's definitive happiness in union with God; this means, for the saved, that in the eschatological perspective suffering is totally blotted out. As a result of Christ's salvific work, man exists on earth with the hope of eternal life and holiness. And even though the victory over sin and death achieved by Christ in his Cross and Resurrection does not abolish temporal suffering from human life, nor free from suffering the whole historical dimension of human existence, it nevertheless throws a new light upon this dimension and upon every suffering: the light of salvation. This is the light of the Gospel, that is, of the Good News. At the heart of this light is the truth expounded in the conversation with Nicodemus: "For God so loved the world that he gave his only Son"(31). This truth radically changes the picture of man's history and his earthly situation: in spite of the sin that took root in this history both as an original inheritance and as the "sin of the world" and as the sum of personal sins, God the Father has loved the only-begotten Son, that is, he loves him in a lasting way; and then in time, precisely through this all-surpassing love, he "gives" this Son, that he may strike at the very roots of human evil and thus draw close in a salvific way to the whole world of suffering in which man shares. At any rate, Christ drew close above all to the world of human suffering through the fact of having taken this suffering upon his very self. During his public activity, he experienced not only fatigue, homelessness, misunderstanding even on the part of those closest to him, but, more than anything, he became progressively more and more isolated and encircled by hostility and the preparations for putting him to death. Christ is aware of this, and often speaks to his disciples of the sufferings and death that await him: "Behold, we are going up to Jerusalem; and the Son of man will be delivered to the chief priests and the scribes, and they will condemn him to death and deliver him to the Gentiles; and they will mock him, and spit upon him, and scourge him, and kill him; and after three days he will rise"(35). Christ goes towards his Passion and death with full awareness of the mission that he has to fulfil precisely in this way. Precisely by means of this suffering he must bring it about "that man should not perish, but have eternal life". 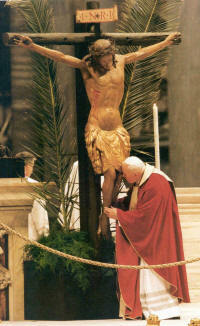 Precisely by means of his Cross he must strike at the roots of evil, planted in the history of man and in human souls. Precisely by means of his Cross he must accomplish the work of salvation. This work, in the plan of eternal Love, has a redemptive character. He who by his Passion and death on the Cross brings about the Redemption is the only-begotten Son whom God "gave". And at the same time this Son who is consubstantial with the Father suffers as a man. His suffering has human dimensions; it also has unique in the history of humanity—a depth and intensity which, while being human, can also be an incomparable depth and intensity of suffering, insofar as the man who suffers is in person the only-begotten Son himself: " God from God". Therefore, only he—the only-begotten Son—is capable of embracing the measure of evil contained in the sin of man: in every sin and in "total" sin, according to the dimensions of the historical existence of humanity on earth. Christ suffers voluntarily and suffers innocently. With his suffering he accepts that question which—posed by people many times—has been expressed, in a certain sense, in a radical way by the Book of Job. Christ, however, not only carries with himself the same question (and this in an even more radical way, for he is not only a man like Job but the only-begotten Son of God), but he also carries the greatest possible answer to this question. One can say that this answer emerges from the very master of which the question is made up. Christ gives the answer to the question about suffering and the meaning of suffering not only by his teaching, that is by the Good News, but most of all by his own suffering, which is integrated with this teaching of the Good News in an organic and indissoluble way. And this is the final, definitive word of this teaching: "the word of the Cross", as Saint Paul one day will say(44). His words also attest to this unique and incomparable depth and intensity of suffering which only the man who is the only-begotten Son could experience; they attest to that depth and intensity which the prophetic words quoted above in their own way help us to understand. Not of course completely (for this we would have to penetrate the divine-human mystery of the subject), but at least they help us to understand that difference (and at the same time the similarity) which exists between every possible form of human suffering and the suffering of the God-man. Gethsemane is the place where precisely this suffering, in all the truth expressed by the Prophet concerning the evil experienced in it, is revealed as it were definitively before the eyes of Christ's soul. After the words in Gethsemane come the words uttered on Golgotha, words which bear witness to this depth—unique in the history of the world—of the evil of the suffering experienced. When Christ says: "My God, My God, why have you abandoned me? ", his words are not only an expression of that abandonment which many times found expression in the Old Testament, especially in the Psalms and in particular in that Psalm 22  from which come the words quoted(47). One can say that these words on abandonment are born at the level of that inseparable union of the Son with the Father, and are born because the Father "laid on him the iniquity of us all"(48). They also foreshadow the words of Saint Paul: "For our sake he made him to be sin who knew no sin"(49). Together with this horrible weight, encompassing the "entire" evil of the turning away from God which is contained in sin, Christ, through the divine depth of his filial union with the Father, perceives in a humanly inexpressible way this suffering which is the separation, the rejection by the Father, the estrangement from God. But precisely through this suffering he accomplishes the Redemption, and can say as he breathes his last: "It is finished"(50). One can also say that the Scripture has been fulfilled, that these words of the Song of the Suffering Servant have been definitively accomplished: "it was the will of the Lord to bruise him"(51). Human suffering has reached its culmination in the Passion of Christ. And at the same time it has entered into a completely new dimension and a new order: it has been linked to love, to that love of which Christ spoke to Nicodemus, to that love which creates good, drawing it out by means of suffering, just as the supreme good of the Redemption of the world was drawn from the Cross of Christ, and from that Cross constantly takes its beginning. The Cross of Christ has become a source from which flow rivers of living water(52). In it we must also pose anew the question about the meaning of suffering, and read in it, to its very depths, the answer to this question. This discovery caused Saint Paul to write particularly strong words in the Letter to the Galatians: "I have been crucified with Christ, it is no longer I who live, but Christ who lives in me: and the life I now live in the flesh I live by faith in the Son of God, who loved me and gave himself for me"(62). Faith enables the author of these words to know that love which led Christ to the Cross. And if he loved us in this way, suffering and dying, then with this suffering and death of his he lives in the one whom he loved in this way; he lives in the man: in Paul. And living in him-to the degree that Paul, conscious of this through faith, responds to his love with love-Christ also becomes in a particular way united to the man, to Paul, through the Cross. This union caused Paul to write, in the same Letter to the Galatians, other words as well, no less strong: "But far be it from me to glory except in the Cross of our Lord Jesus Christ, by which the world has been crucified to me, and I to the world"(63). 21. The Cross of Christ throws salvific light, in a most penetrating way, on man's life and in particular on his suffering. For through faith the Cross reaches man together with the Resurrection: the mystery of the Passion is contained in the Paschal Mystery. The witnesses of Christ's Passion are at the same time witnesses of his Resurrection. Paul writes: "That I may know him (Christ) and the power of his Resurrection, and may share his sufferings, becoming like him in his death, that if possible I may attain the resurrection from the dead"(64). Truly, the Apostle first experienced the "power of the Resurrection" of Christ, on the road to Damascus, and only later, in this paschal light, reached that " sharing in his sufferings" of which he speaks, for example, in the Letter to the Galatians. The path of Paul is clearly paschal: sharing in the Cross of Christ comes about through the experience of the Risen One, therefore through a special sharing in the Resurrection. Thus, even in the Apostle's expressions on the subject of suffering there so often appears the motif of glory, which finds its beginning in Christ's Cross. 22. To the prospect of the Kingdom of God is linked hope in that glory which has its beginning in the Cross of Christ. The Resurrection revealed this glory—eschatological glory—which, in the Cross of Christ, was completely obscured by the immensity of suffering. Those who share in the sufferings of Christ are also called, through their own sufferings, to share in glory. Paul expresses this in various places. To the Romans he writes: " We are ... fellow heirs with Christ, provided we suffer with him in order that we may also be glorified with him. I consider that the sufferings of this present time are not worth comparing with the glory that is to be revealed in us"(67). In the Second Letter to the Corinthians we read: "For this slight momentary affliction is preparing for us an eternal weight of glory beyond all comparison, because we look not to the things that are seen but to things that are unseen"(68). The Apostle Peter will express this truth in the following words of his First Letter: "But rejoice in so far as you share Christ's sufferings, that you may also rejoice and be glad when his glory is revealed "(69). The motif of suffering and glory has a strictly evangelical characteristic, which becomes clear by reference to the Cross and the Resurrection. The Resurrection became, first of all, the manifestation of glory, which corresponds to Christ's being lifted up through the Cross. If, in fact, the Cross was to human eyes Christ's emptying of himself, at the same time it was in the eyes of God his being lifted up. On the Cross, Christ attained and fully accomplished his mission: by fulfilling the will of the Father, he at the same time fully realized himself. In weakness he manifested his power, and in humiliation he manifested all his messianic greatness. Are not all the words he uttered during his agony on Golgotha a proof of this greatness, and especially his words concerning the perpetrators of his crucifixion: "Father, forgive them for they know not what they do"(70)? To those who share in Christ's sufferings these words present themselves with the power of a supreme example. Suffering is also an invitation to manifest the moral greatness of man, his spiritual maturity. Proof of this has been given, down through the generations, by the martyrs and confessors of Christ, faithful to the words: "And do not fear those who kill the body, but cannot kill the soul . 23. Suffering, in fact, is always a trial—at times a very hard one—to which humanity is subjected. The gospel paradox of weakness and strength often speaks to us from the pages of the Letters of Saint Paul, a paradox particularly experienced by the Apostle himself and together with him experienced by all who share Christ's sufferings. Paul writes in the Second Letter to the Corinthians: "I will all the more gladly boast of my weaknesses, that the power of Christ may rest upon me"(72). In the Second Letter to Timothy we read: "And therefore I suffer as I do. But I am not ashamed, for I know whom I have believed"(73). And in the Letter to the Philippians he will even say: "I can do all things in him who strengthens me"(74). In the Paschal Mystery Christ began the union with man in the community of the Church. The mystery of the Church is expressed in this: that already in the act of Baptism, which brings about a configuration with Christ, and then through his Sacrifice—sacramentally through the Eucharist—the Church is continually being built up spiritually as the Body of Christ. In this Body, Christ wishes to be united with every individual, and in a special way he is united with those who suffer. The words quoted above from the Letter to the Colossians bear witness to the exceptional nature of this union. For, whoever suffers in union with Christ— just as the Apostle Paul bears his "tribulations" in union with Christ— not only receives from Christ that strength already referred to but also "completes" by his suffering "what is lacking in Christ's afflictions". This evangelical outlook especially highlights the truth concerning the creative character of suffering. The sufferings of Christ created the good of the world's redemption. This good in itself is inexhaustible and infinite. No man can add anything to it. But at the same time, in the mystery of the Church as his Body, Christ has in a sense opened his own redemptive suffering to all human suffering. In so far as man becomes a sharer in Christ's sufferings—in any part of the world and at any time in history—to that extent he in his own way completes the suffering through which Christ accomplished the Redemption of the world. Does this mean that the Redemption achieved by Christ is not complete? No. It only means that the Redemption, accomplished through satisfactory love, remains always open to all love expressed in human suffering. In this dimension—the dimension of love—the Redemption which has already been completely accomplished is, in a certain sense, constantly being accomplished. Christ achieved the Redemption completely and to the very limits but at the same time he did not bring it to a close. In this redemptive suffering, through which the Redemption of the world was accomplished, Christ opened himself from the beginning to every human suffering and constantly does so. Yes, it seems to be part of the very essence of Christ's redemptive suffering that this suffering requires to be unceasingly completed. Thus, with this openness to every human suffering, Christ has accomplished the world's Redemption through his own suffering. For, at the same time, this Redemption, even though it was completely achieved by Christ's suffering, lives on and in its own special way develops in the history of man. It lives and develops as the body of Christ, the Church, and in this dimension every human suffering, by reason of the loving union with Christ, completes the suffering of Christ. It completes that suffering just as the Church completes the redemptive work of Christ. The mystery of the Church—that body which completes in itself also Christ's crucified and risen body—indicates at the same time the space or context in which human sufferings complete the sufferings of Christ. Only within this radius and dimension of the Church as the Body of Christ, which continually develops in space and time, can one think and speak of "what is lacking" in the sufferings of Christ. The Apostle, in fact, makes this clear when he writes of "completing what is lacking in Christ's afflictions for the sake of his body, that is, the Church". 25. The witnesses of the Cross and Resurrection of Christ have handed on to the Church and to mankind a specific Gospel of suffering. The Redeemer himself wrote this Gospel, above all by his own suffering accepted in love, so that man "should not perish but have eternal life"(80). This suffering, together with the living word of his teaching, became a rich source for all those who shared in Jesus' sufferings among the first generation of his disciples and confessors and among those who have come after them down the centuries. It is especially consoling to note—and also accurate in accordance with the Gospel and history—that at the side of Christ, in the first and most exalted place, there is always his Mother through the exemplary testimony that she bears by her whole life to this particular Gospel of suffering. In her, the many and intense sufferings were amassed in such an interconnected way that they were not only a proof of her unshakeable faith but also a contribution to the redemption of all. In reality, from the time of her secret conversation with the angel, she began to see in her mission as a mother her "destiny" to share, in a singular and unrepeatable way, in the very mission of her Son. And she very soon received a confirmation of this in the events that accompanied the birth of Jesus in Bethlehem, and in the solemn words of the aged Simeon, when he spoke of a sharp sword that would pierce her heart. Yet a further confirmation was in the anxieties and privations of the hurried flight into Egypt, caused by the cruel decision of Herod. And again, after the events of her Son's hidden and public life, events which she must have shared with acute sensitivity, it was on Calvary that Mary's suffering, beside the suffering of Jesus, reached an intensity which can hardly be imagined from a human point of view but which was mysterious and supernaturally fruitful for the redemption of the world. Her ascent of Calvary and her standing at the foot of the Cross together with the Beloved Disciple were a special sort of sharing in the redeeming death of her Son. And the words which she heard from his lips were a kind of solemn handing-over of this Gospel of suffering so that it could be proclaimed to the whole community of believers. As a witness to her Son's Passion by her presence, and as a sharer in it by her compassion, Mary offered a unique contribution to the Gospel of suffering, by embodying in anticipation the expression of Saint Paul which was quoted at the beginning. She truly has a special title to be able to claim that she "completes in her flesh"—as already in her heart—"what is lacking in Christ's afflictions ". Christ did not conceal from his listeners the need for suffering. He said very clearly: "If any man would come after me... let him take up his cross daily ''(81), and before his disciples he placed demands of a moral nature that can only be fulfilled on condition that they should "deny themselves"(82). The way that leads to the Kingdom of heaven is "hard and narrow", and Christ contrasts it to the "wide and easy" way that "leads to destruction"(83). On various occasions Christ also said that his disciples and confessors would meet with much persecution, something which—as we know—happened not only in the first centuries of the Church's life under the Roman Empire, but also came true in various historical periods and in other parts of the world, and still does even in our own time. This first chapter of the Gospel of suffering, which speaks of persecutions, namely of tribulations experienced because of Christ, contains in itself a special call to courage and fortitude, sustained by the eloquence of the Resurrection. Christ has overcome the world definitively by his Resurrection. Yet, because of the relationship between the Resurrection and his Passion and death, he has at the same time overcome the world by his suffering. Yes, suffering has been singularly present in that victory over the world which was manifested in the Resurrection. Christ retains in his risen body the marks of the wounds of the Cross in his hands, feet and side. Through the Resurrection, he manifests the victorious power of suffering, and he wishes to imbue with the conviction of this power the hearts of those whom he chose as Apostles and those whom he continually chooses and sends forth. The Apostle Paul will say: "All who desire to live a godly life in Christ Jesus will be persecuted"(87). 28. To the Gospel of suffering there also belongs—and in an organic way—the parable of the Good Samaritan. Through this parable Christ wished to give an answer to the question: "Who is my neighbour? "(90) For of the three travellers along the road from Jerusalem to Jericho, on which there lay half-dead a man who had been stripped and beaten by robbers, it was precisely the Samaritan who showed himself to be the real "neighbour" of the victim: "neighbour" means also the person who carried out the commandment of love of neighbour. Two other men were passing along the same road; one was a priest and the other a Levite, but each of them " saw him and passed by on the other side". The Samaritan, on the other hand, "saw him and had compassion on him. He went to him, ... and bound up his wounds ", then "brought him to an inn, and took care of him"(91). And when he left, he solicitously entrusted the suffering man to the care of the innkeeper, promising to meet any expenses. 29. Following the parable of the Gospel, we could say that suffering, which is present under so many different forms in our human world, is also present in order to unleash love in the human person, that unselfish gift of one's "I" on behalf of other people, especially those who suffer. The world of human suffering unceasingly calls for, so to speak, another world: the world of human love; and in a certain sense man owes to suffering that unselfish love which stirs in his heart and actions. The person who is a " neighbour" cannot indifferently pass by the suffering of another: this in the name of fundamental human solidarity, still more in the name of love of neighbour. He must "stop", "sympathize", just like the Samaritan of the Gospel parable. The parable in itself expresses a deeply Christian truth, but one that at the same time is very universally human. It is not without reason that, also in ordinary speech, any activity on behalf of the suffering and needy is called "Good Samaritan" work. Here we come to the enormous importance of having the right attitudes in education. The family, the school and other education institutions must, if only for humanitarian reasons, work perseveringly for the reawakening and refining of that sensitivity towards one's neighbour and his suffering of which the figure of the Good Samaritan in the Gospel has become a symbol. Obviously the Church must do the same. She must even more profoundly make her own—as far as possible—the motivations which Christ placed in his parable and in the whole Gospel. The eloquence of the parable of the Good Samaritan, and of the whole Gospel, is especially this: every individual must feel as if called personally to bear witness to love in suffering. The institutions are very important and indispensable; nevertheless, no institution can by itself replace the human heart, human compassion, human love or human initiative, when it is a question of dealing with the sufferings of another. This refers to physical sufferings, but it is even more true when it is a question of the many kinds of moral suffering, and when it is primarily the soul that is suffering. 30. The parable of the Good Samaritan, which —as we have said—belongs to the Gospel of suffering, goes hand in hand with this Gospel through the history of the Church and Christianity, through the history of man and humanity. This parable witnesses to the fact that Christ's revelation of the salvific meaning of suffering is in no way identified with an attitude of passivity. Completely the reverse is true. The Gospel is the negation of passivity in the face of suffering. Christ himself is especially active in this field. In this way he accomplishes the messianic programme of his mission, according to the words of the prophet: "The Spirit of the Lord is upon me, because he has anointed me to preach good news to the poor. He has sent me to proclaim release to the captives and recovering of sight to the blind, to set at liberty those who are oppressed, to proclaim the acceptable year of the Lord"(93). In a superabundant way Christ carries out this messianic programme of his mission: he goes about "doing good"(94). and the good of his works became especially evident in the face of human suffering. The parable of the Good Samaritan is in profound harmony with the conduct of Christ himself. Finally, this parable, through its essential content, will enter into those disturbing words of the Final Judgment, noted by Matthew in his Gospel: "Come, O blessed of my Father, inherit the kingdom prepared for you from the foundation of the world; for I was hungry and you gave me food, I was thirsty and you gave me drink, I was a stranger and you welcomed me, I was in prison and you came to me"(95). To the just, who ask when they did all this to him, the Son of Man will respond: "Truly, I say to you, as you did it to one of the least of these my brethren, you did it to me"(96). The opposite sentence will be imposed on those who have behaved differently: "As you did it not to one of the least of these, you did it not to me"." One could certainly extend the list of the forms of suffering that have encountered human sensitivity, compassion and help, or that have failed to do so. The first and second parts of Christ's words about the Final Judgment unambiguously show how essential it is, for the eternal life of every individual, to "stop", as the Good Samaritan did, at the suffering of one's neighbour, to have "compassion" for that suffering, and to give some help. In the messianic programme of Christ, which is at the same time the programme of the Kingdom of God, suffering is present in the world in order to release love, in order to give birth to works of love towards neighbour, in order to transform the whole of human civilization into a "civilization of love". In this love the salvific meaning of suffering is completely accomplished and reaches its definitive dimension. Christ's words about the Final Judgment enable us to understand this in all the simplicity and clarity of the Gospel. Suffering is certainly part of the mystery of man. Perhaps suffering is not wrapped up as much as man is by this mystery, which is an especially impenetrable one. The Second Vatican Council expressed this truth that "...only in the mystery of the Incarnate Word does the mystery of man take on light. In fact..., Christ, the final Adam, by the revelation of the mystery of the Father and his love, fully reveals man to himself and makes his supreme calling clear"(100). If these words refer to everything that concerns the mystery of man, then they certainly refer in a very special way to human suffering. Precisely at this point the "revealing of man to himself and making his supreme vocation clear" is particularly indispensable. It also happens as experience proves—that this can be particularly dramatic. But when it is completely accomplished and becomes the light of human life, it is particularly blessed. "Through Christ and in Christ, the riddles of sorrow and death grow meaningful"(101).